Aleta Karstad – 1 October finds me painting at the upstream rapids of Sturgeon Chute on the Wanapite River, 6.7 kilometres northwest of Hartley Bay. 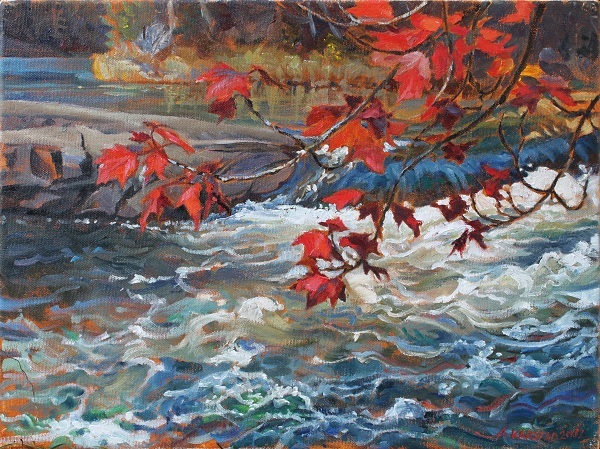 To get just the right angle on the rapids, screened by flaming leaves of an overhanging Red Maple, I’m standing on a narrow grassy ledge, the small of my back leaning against a cold wall of smooth granite, with the feet of my easel only a few centimetres from the edge. About two metres below, courses the fast deep water…. To read Aleta’s notes and purchase her paintings, click here to visit Aleta’s website. For more information on Sturgeon Chute – click here. Firstly, the French River Delta Association wishes to congratulate you on winning the Liberal leadership contest and becoming our Premier-designate. We look forward to your term of office. The French River Delta Association consists of the cottagers and local business owners who depend on the French River ecosystem. We are committed to ensuring that this ecosystem is sustained for future generations. French River Delta Association members had fervently hoped that the transition from Mr. McGuinty’s governance to yours would create a clean slate and lead to a model of governance that includes fairness, transparency and verifiable legitimate decisions. However, we are concerned that, with the inclusion of Mr. Arnold Chan on your transition team, it is possible that politically connected corporations could unfairly influence decisions of policy-makers and regulatory agencies in Ontario, especially concerning the critical area of energy generation. I have recently read Technical Report No. 06-03 produced for the Upper Great Lakes Management Unit – Lake Superior. This is a very thorough report that states that the collapse of the Black Bay walleye fishery coincides with the dam construction1. It states that many costly mitigation attempts were made to improve the fishery in the area, with little or no improvement. The final recommendation of this report is to remove the dam. I find it interesting that the major concerns were regarding the collapse of the commercial fishery and the loss of the recreational fishery. The report claims that if the dam was removed “Black Bay walleye population that is sufficiently recovered to permit recreational angling on Black Bay would be worth several hundred thousand dollars per year to open-water anglers from Thunder Bay alone.”2 To me, this means that the main concern of the Ministry of Natural Resources is all about profits! 5. Xeneca may be using improperly obtained funding for the project. ORA FUNDRAISER – 50% of the profit from the purchase of these calendars will go to help Ontario Rivers Alliance in our mandate to protect, conserve and restore riverine ecosytems. This calendar would make a great Christmas present! A BIG THANKS to Aleta and Fred for making this possible! A calendar for 2013 of Aleta Karstad’s oil paintings en plein air of rivers, rapids, and waterfalls in Ontario. Aleta travels with her biologist husband Fred Schueler to precious wild rivers that still run free with rapids and waterfalls, to paint and explore for little-known native mussels and crayfish, documenting these vulnerable wild communities in art and science. The image of each painting is accompanied by Aleta and Fred’s writings about their adventures in discovering the special nature of the place, as well as the nature of the threats to its integrity, leading us to enquire whether new hydroelectric projects on our wild rivers are desirable or necessary. 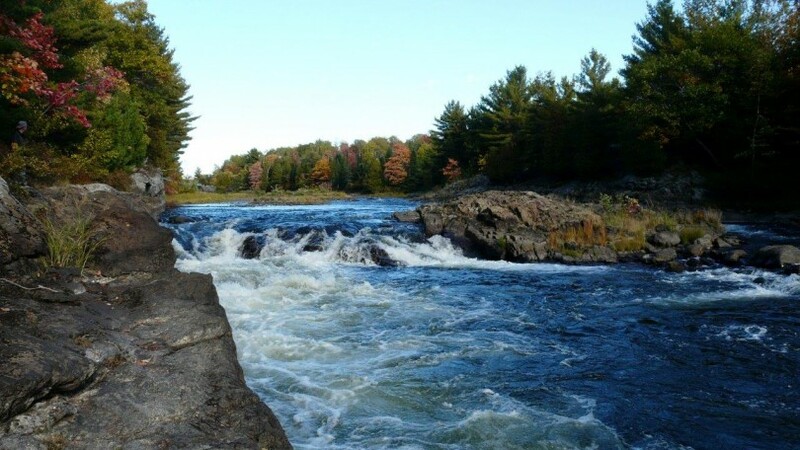 The Municipality of Killarney passed a Motion to reject the Allen & Struthers Hydroelectric proposals on the Wanapitei River. Is this How You Want to See Your OPSEU Pension Fund Invested? 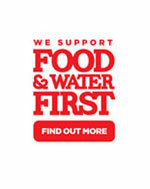 It has come to our attention that at least 18 modified run-of-river hydroelectric proposals are funded through the government employees’ pension trust fund – OPSEU – OPTrust. These types of hydroelectric dams carry numerous negative impacts1 resulting in reduced water quality and water quantity, destruction of habitat and spawning areas, place extreme pressure on fish and endangered species survival, and the frequent and extreme swings in water flow velocity and water levels pose a serious threat to public health and safety. MNR and MOE staff are assigned to facilitate these proposals through the Environmental Assessment, permits, and approvals process, and ultimately through to completion. It is also MNR and MOE that make the final decisions on whether these proposals are approved. With their own pension monies at risk, this would appear to be a clear conflict of interest.